I'm featured on the Random House Author Spotlight. The same material, but in a slightly different format, is at Random House Kids. So, uh, Holy Delacorte Press!! 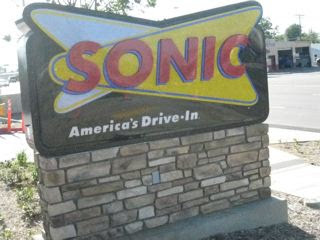 Last spring, my town of about 60,000 got a Sonic. Big whoop, you might think. Well, apparently it was. 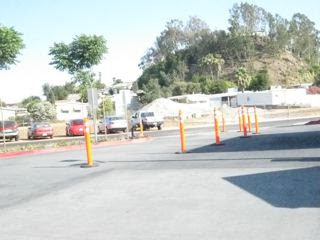 You couldn't even get in the main driveway, but got directed around to a side street. And this popularity continued and continued. Inexplicably. I mean, we're just talking burgers and tater tots. I was stuck driving dh's car with its TOTALLY CLOUDY REAR WINDOW THAT YOU CAN'T SEE A SINGLE THING OUT OF. (Dh and Child #3 drove my clear-windowed van to Ontario, CA for Child #3's water polo tournament. (Yes, he played brilliantly, in case you were wondering.) I reminded Child #2 and Child #4 that we had mapped out our weekend to AVOID REVERSING situations. Yes, I did manage to back out of the ordering area. I did not run over a waiter zipping around on roller blades or smash into another car. I did, however, sweat buckets. on a weirdo back street. Seriously, I didn't have a clue where we were. It was like we'd entered a SONIC DIMENSION. We drove FORWARD for a while, until we eventually recognized a street and were able to find our way home. Dh and Child #3 have returned from their little trip. I now have my van back. I may spend my entire Monday driving around town IN REVERSE! Ha! And just to show you how quick children are to take advantage of a situation, here a couple of the statements Child #2 and Child #3 said to me over the course of the weekend. And by "said," I mean in a "whispered in an eerie, ghost-story voice." Child #2: "This is the Sonic Dimension talking. Raise Child #2's allowance. A lot." Child #4: "The Sonic Dimension wants you to give me another popsicle." For links to the other MTM participants, please head over to our My Town Monday blog which was set up by the lovely and talented Clair Dickson. Thank you to Travis Erwin for launching us on this crazy My Town Monday journey. A journey from which there is no reversing. (I couldn't resist.) Next week, I'll be back to a normal MTM post. Promise. Odd but very humerous post. I've eaten at Sonic maybe twice and just don't care for it. Maybe you have to be hooked young like we were with McDonalds. I don't think we have Sonic around here. Funny post, Barrie. Loved your author profile, which is also very funny. Your kids are great! Telling you what to do from the Sonic dimension. Congrats to Child #3 on the water polo. Sonic reminds me of the A&Ws in the 50s and 60s. You had to be there to enjoy it. Naughty, naughty with the back window. 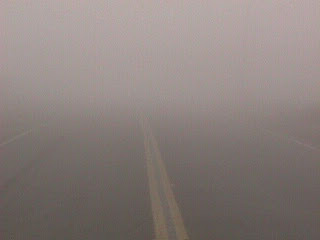 You were lucky not to be pulled over for a visibility hazard. I ate at Sonic yesterday. We have one right by our place. I get Diet Coke with Strawberry added to it. And the Strawberry Limeade Chillers are to die for. But seriously, I once waited over 15 minutes for a Diet Coke. It's sort of an all day experience. I'm with David. I've eaten a couple of times at Sonic and just generally don't care much for the food. Bland. We have a Sonic that opened up a little over a year ago, but I haven't gone yet. It's just fast food, right? Annie: it is just fast food. Child #2 tried a burger between two pieces of bread and chili fries. Child #4 had tater tots and some sort of frozen-ish drink. I had a diet coke. The ice was different--in a good way. Mmmmm...greasy hamburgers :) Doesn't get much better than that. I am glad that you survived the backing up without a back window incident! their double meat cheese burgers with tots and rings are to die for. i love me some sonic. PS Thank you for the visit and I'll look forward to the bench! The things you do for your kids! I'm so glad you survived the "Sonic Zone". Loved your author spotlight. have you ever noticed that after eating a sonic burger the smell stays with you ALL day? on your hands, your clothes...your breath. no? just me? Now that you have Sonic you are probably tortured with those stupid commercial with those two nerve-wracking doofuses. Or is it Doofi. Not sure of the plural for doofus. Cool that you're featured on Random House. I'm off to check it out now! Ha! My verification word is "psych"!! Is Sonic a southern thing? we don't have one here, but we always see the ads on TV. We do NOT have a Sonic here,and now I am pissed. Sonics are EVERYWHERE here--my kids are big fans of the drink options. Watch out for the foot long coney though--ugh! 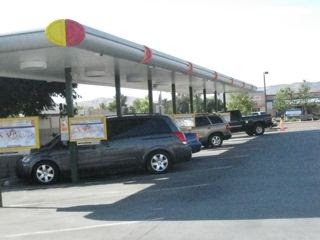 I'll take an extra-long cheese coney with tater tots, and a Route 44 Root Beer (you know, with that great Sonic ice!). Oooh Sonic slushes are the best! Food, no. Slushes, yes. Glad you backed out okay! If you lived in Missouri, I'd guess that it was YOU backing up my street at 30 mph the other day. I was having trouble imagining why anyone would do this, but now I have a logical explanation!